with one of our Doctors to discuss you problems and our possible solutions. Get seen today as a new patient, in most cases. We accept BCBS, Medicare, and most major medical insurances. If you're a cash patient, then Millar Chiropractic Clinics extends to you Welcome we accept cash patient. This is a chance for you to meet with one of our Doctors for a Free* 15-20 minute discussion of your problems to see: 1) if we can help you 2) how long will it take and 3) how much will it cost. In pain? Get seen today in most cases. Just tell the front desk that you're in pain and need to be seen today. For a $49.00 donation benefiting the "Wounded Warrior Project", you get the Millar "Personalized Pain Finder Evaluation" and a Report of Findings visit. Help a returning soldier and help yourself at the same time. Start Getting out of PAIN Today!! Tired of being herded into a room only to spend less than 5 min with the Doctor? Tired of Doctors not even touching you but examining you from across the room? So are WE. 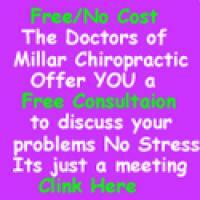 Discover Chiropractic Excellence at Millar Chiropractic Clinics TM. for your appointments at any of our clinics. At Millar Chiropractic Clinic, we like to say "Millar's Got Your Back And More". We treat lots of other areas, from Arthritis to Whiplash. We understand how to help you get out of pain and start living again. Most New Patients seen the same day. Millar Chiropractic Clinics will gladly bill your insurance company in most cases. But remember your insurance is a contract between you and your insurance company and you are still responsible for your bill if the insurance company does not pay. Dr Greg Millar DC CCEP does not accept any insurance. He does not participate with BCBS or Medicare. He gladly offers a Free* consultation to all patients to see him along with your Millar Chiropractor to discuss your case. Dr Millar himself treats things normally not covered by BCBS or Medicare like Functional Medicine.